Rocky Road ice cream was invented in 1929 by William Dreyer, who is also credited for coining the term “Rocky Road” — an allusion to The Great Depression and the tough times ahead. As for Tin Roof ice cream, it may have originated from a popular sundae of vanilla ice cream with caramel and fudge sauce topped with red-skinned Spanish peanuts which resembled the red tin shingles used on barns. Over time the sundae turned into an ice cream flavor, but Spanish peanuts were not always used, thus the “tin roof” didn’t make as much sense. Yet the name stuck, and the mixture of vanilla, peanuts, caramel and sometimes fudge is what most people consider “Tin Roof”. This is the pie form of Tin Roof ice cream. This Tin Roof Pie has an unbaked blend of graham crackers and butter for the crust. 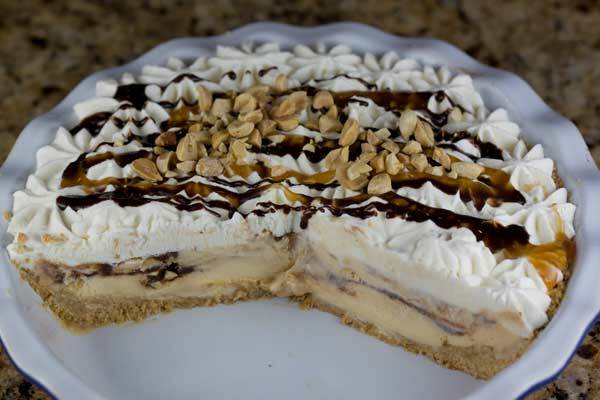 The filling is vanilla ice cream (I used HEB brand 1905 Vanilla) mixed with caramel sauce, peanuts and fudge, and the topping is sweetened whipped cream. It’s simple to make and a nice change from Rocky Road (which is not to say I wouldn’t want to make a Rocky Road version). Mix together the crumbs and butter. Press into and up the sides of a buttered 9 inch pie dish. Put in the freezer for about 15 minutes. Put the softened ice cream in a bowl and stir in peanuts. Add the caramel topping and stir so that the caramel topping is partially mixed in, but streaks of caramel still show. Spoon half of the mixture into the pie shell. Spoon a few lines of fudge sauce over the caramel ice cream mixture, then spoon remaining ice cream over the top to cover the fudge sauce. Cover with a sheet of plastic wrap and freeze until firm (at least 4 hours). About 2 hours before you plan to serve the pie, prepare the whipped cream. Beat cream until soft peaks start to form. Beat in the sugar and vanilla. When peaks are stiff, spread or pipe over the top of the pie. Return to the freezer for another hour or until whipped cream is firm. 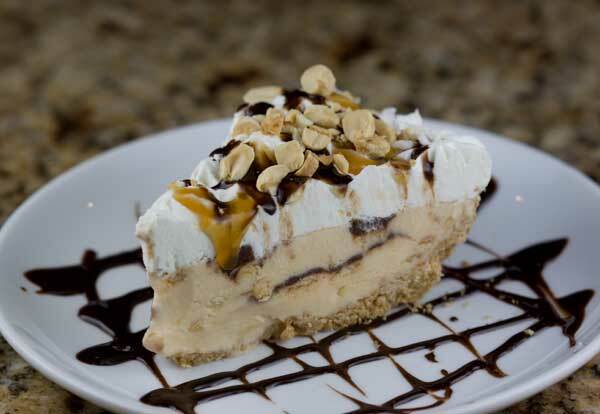 Before serving, garnish the whole pie or individual pieces with extra caramel sauce, chopped peanuts and chocolate syrup. If you buttered the pie plate, you shouldn't have any problems removing the pie from the pan. To ensure easy removal, set the frozen pie in a roasting pan and put hot water in the pan so that it comes about halfway up the sides. Let it sit for a minute or two so that the frozen butter on the inside of the pie plate loosens. The pie should scoop right out. Notes: To make fudge sauce, combine 4 tablespoons of heavy cream, 2 tablespoons corn syrup and 2 tablespoons of sugar in a small saucepan. Heat over medium low, stirring constantly, until sugar dissolves. Remove from heat and stir in 3 ounces of chopped chocolate and ¼ teaspoon of vanilla. Stir until smooth. Let cool completely before using. It is great to hear Todd’s first-hand opinion! I had some of this last night and it was fantastic!